Today’s image of the Laser Guide Star of Gemini North makes a sweet wallpaper. 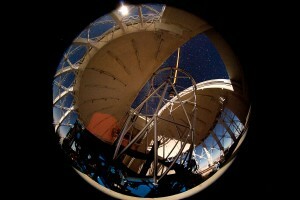 Peeking in from behind the LGS system is the sky over the island of Hawaii and, yes, the moon! Click on the image above to connect to the wallpaper download page. 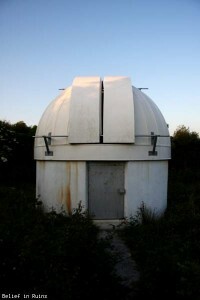 Are we still talking about abandoned observatories? 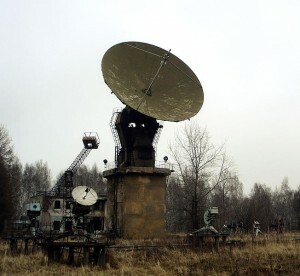 If so, I’ve gathered a few links for the Zimenki Radio Astronomy Station in Nizhny Novgorod, Russia. The Zemenki Station was built for Gorki University in 1949, near the village of Zimenki on the Volga River. 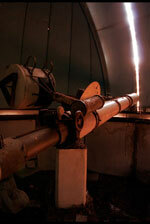 Originally, only a single radio telescope was constructed on the station. 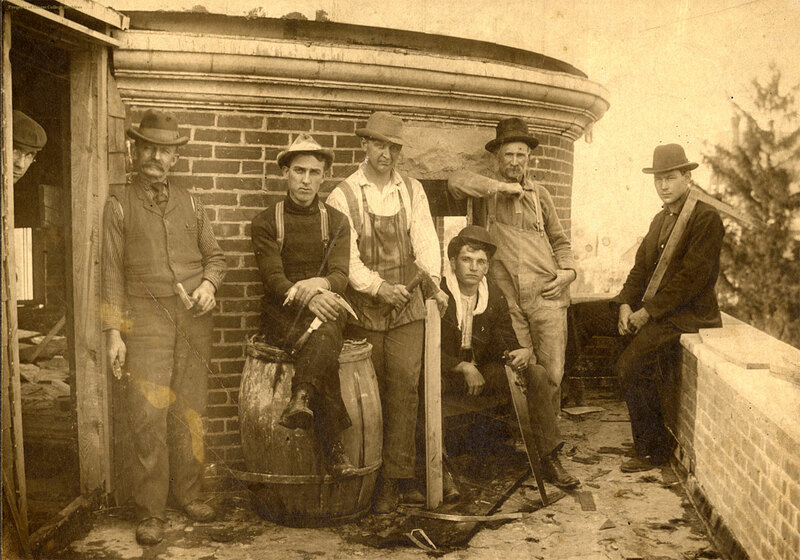 Eventually, two dishes were erected at the site. I’m not quite sure when work at Zimenki came to an end. 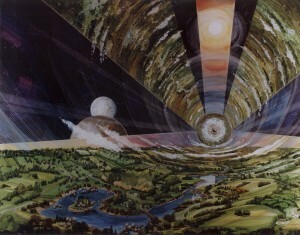 It was functioning in 1964, when Zimenki and Jodrell Bank participated in several communication exercises. According to the Committee on Radio Astronomy, a single dish was operational as recently as 2002. If it’s still working, I can’t find information about it. A visitor to the site in 2010 indicated that there was only one dish on the station, but none of the radio telescopes was in working order. If anyone can direct me to more information (in Russian or English, print or digital), I’d appreciate it. 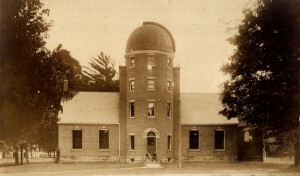 W. T. Sullivan III, Ed., The Early Years of Radio Astronomy: Reflections Fifty Years After Jansky’s Discovery (Cambridge: Cambridge University Press, 1984): 274. Edward Clinton Ezell and Linda Neuman Ezell, The Partnership: A History of the Apollo-Soyuz Test Project (http://history.nasa.gov/SP-4209/ch2-5.htm). Urban Exploration Resource has a description and gallery of what remains of the “Observatory for Cornwall” charitable project on Wheal Busy, Truro, Cornwall. Jet Engine for blowing snow off the (former) 300 foot telescope at the NRAO Green Bank. 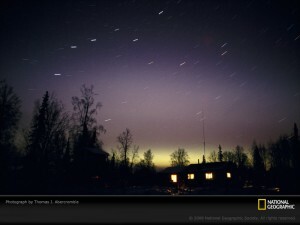 Photo courtesy NRAO. 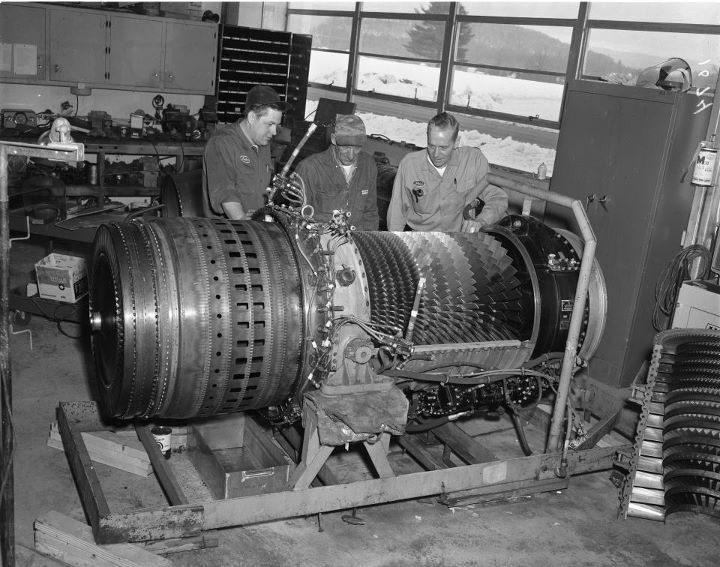 I found this photo, which shows an unnamed technician, Clifford Barkely, and Paul Devlin inspecting a jet engine, in NRAO’s facebook photo album. Back in the olden days (okay, before the 1988 collapse of the 300-Foot Telescope), engineers used to set up a jet engine next to the dish to blow it clean it of accumulated snow. I can only imagine the noise—I used to complain about the wind machines in the orchard next to my house when they ran during cold spring nights, and those were powered by car, not jet, engines (you can listen to one here, or you can just imagine a Chevy V-8 parked outside your bedroom window). Since the 300-Foot Telescope is no more, the snow now accumulates in the dish of its replacement, the Green Bank Telescope (GBT). I’ve never seen it in action, but apparently controllers just tilt the dish past the angle of repose so the snow slides out. Maybe not as awesome as a jet engine blowing snow off the instrument, but I bet it’s still plenty interesting to watch an avalanche clearing a 100-meter dish. Abandoned. Photo credit: Andre Joosse. For some reason, I missed the fact that yesterday was Wednesday. I’ll make it up to you next week. In the meantime, enjoy these beautiful images of an abandoned residential observatory near Villa Nostra, somewhere in Belgium (thanks, Inge!). 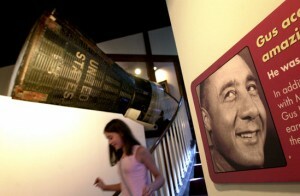 One of the first places we visited after moving to Indiana in 1997 was the Gus Grissom Memorial at Spring Mill State Park, just east of Mitchell, Indiana. 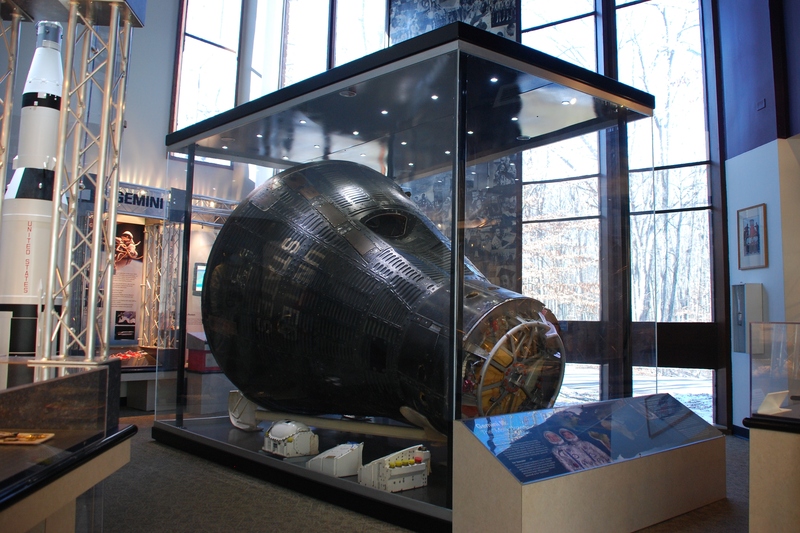 The memorial display was pretty minimalistic back then, consisting of the Gemini 3 space capsule “Molly Brown” and a case with Grissom’s space suit, helmet and gloves. 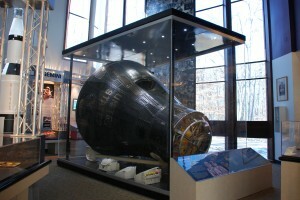 Still, it was pretty awesome, because you could get up close and personal with the space capsule. 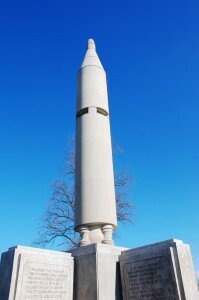 In 2009, the memorial was renovated completely. And when I say “completely,” I mean COMPLETELY. We stopped to visit on our way into the park to do some winter hiking, and wow, were we surprised by what we found. As you can see, the Molly Brown is now untouchable as well as unsinkable, behind glass. The little kid in me is a little sad that I can’t touch it anymore. The heritage professional in me knows it’s a good idea to protect it from the little kid in me. Anyway, there’s a lot more to look at and play with in the new display rooms, so I’m telling myself that’s a good trade off. The display was expanded to include information about the town of Mitchell, the principles of aviation, and the history of rocket development. It also has many more of Grissom’s personal and professional artifacts, including his report cards, war medals, and space glove molds. 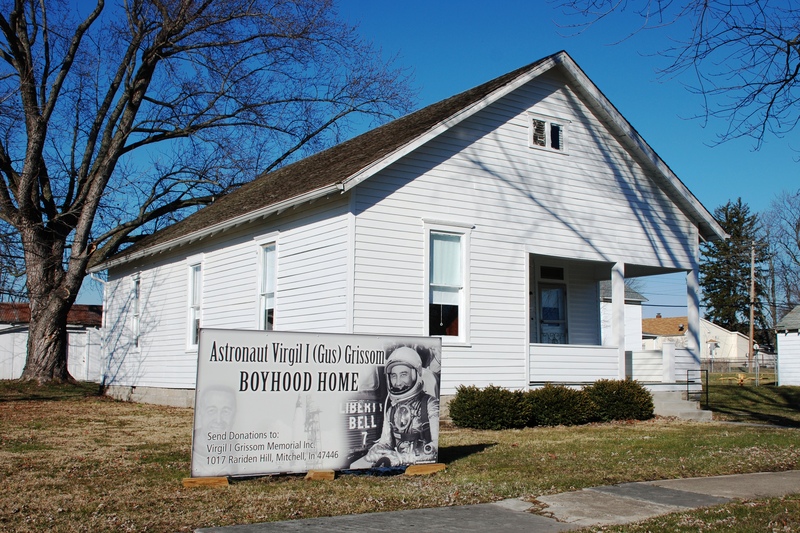 The park ranger told us that Betty Grissom, Gus’s widow, donated enough material that they can rotate the displays to keep the content “fresh.” I hope they never take Grissom’s report cards off display. It’s heartening to see all those Cs (not to mention the F in Latin). Once Grissom found something he really wanted to do—be a test pilot—he had a good reason to study. His handwritten essays for his aviation exams are on show to prove it. The exhibit includes several interactive displays (I missed one T/F question at each screen) and a short movie about Grissom’s early life and NASA career. I spent some time working the pitch-roll-yaw controls of the model plane display. 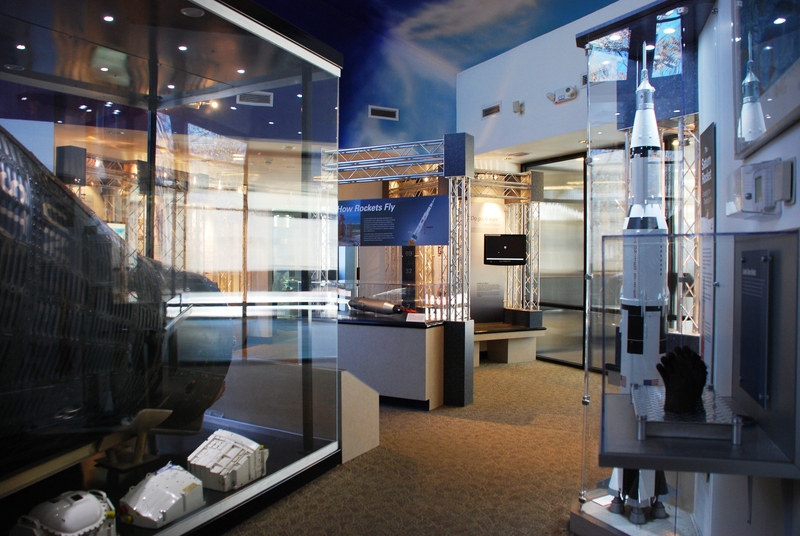 I didn’t tell the strangers studying the model of the Saturn V rocket about my multiple visits to the Saturn V Center at Kennedy Space Center in November. 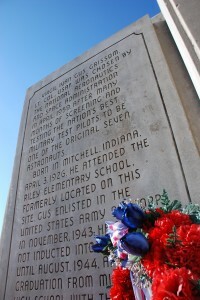 There are two other Gus Grissom sites in Mitchell, Indiana. The first is the Gus Grissom Monument, a 44-foot tall limestone recreation of the Redstone rocket that carried Grissom’s first space capsule, the Mercury Liberty Bell 7, into suborbital flight. 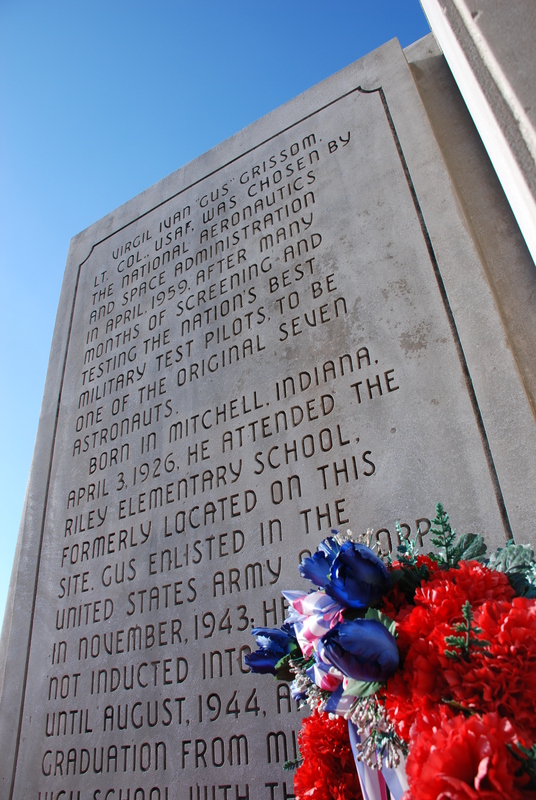 The monument marks the site of Riley School, where Grissom earned mostly average grades. I’ve uploaded more photos of all three sites to my flickr account. If you want a hands-on experience with a Gemini capsule, you can go play in the Gemini trainer at the Louisville Science Center (I recommend this). Well, we know where I stand on that issue (is there a reason humans have to claim every bit of the universe as their very own natural resource? ), but still, I love some of the artwork that came out of those early brainstorming sessions. You’ve got to love the mid-century modern multi-family dwellings with terra cotta patios. 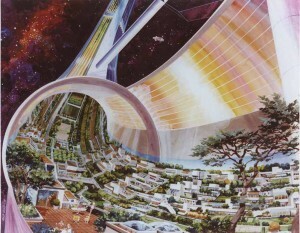 A more complete collection of renderings of 1975, 1976, and 1978 proposals can be found on the Space Settlement site. If you hit this page trying to find the current position of the Mars Science Laboratory, click through here to go to NASA-JPL’s Where is Curiosity? page. JPL updates the simulated views of Curiosity’s journey daily.